When I saw the Baby Aid Compact baby-and-child first aid kit, I looked at the funky flowery waterproof pouch and said to my daughter, "Oooh that's pretty. Let's see if we can guess what's inside". So we started listing all the usual suspects : plasters - bandages - scissors - gauze dressings - maybe some antiseptic wipes ? Ummm .... errrr ... can't think of anything else much. OK, let's have a look and see if it's all there ! Well it was ... but along with a whole host of other things I'd never have even thought of ! It's amazing that all that is stuffed into a pocket-sized pouch measuring 15cm x 10cm x 5cm. It's small enough to fit into a handbag or the glovebox of a car and would be a very useful addition to a change bag too, just in case. The two mesh pockets hold everything in place so you can quickly and easily locate everything, saving you precious seconds when you may need them most. My favourite items are the little added extras that you don't find in most first aid kits. 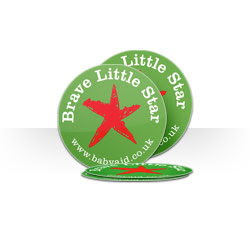 The Brave Little Star stickers are arguably the most useful item in there, right up there with Magic Mummy Kisses at the top of the pain-easing efficiency stakes ! The "How to make it better" and "What's it all for ?" little guides are packed with simple to understand and useful information to help you keep your head in most everyday emergencies and accidents. 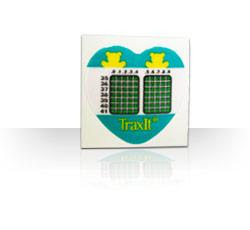 The Disposable Traxit children's thermometers are ingenious and I've never seen them before. You stick the adhesive side to the skin deep in the armpit and it will give you the temperature within 2-3 minutes. The really clever part is that you can leave it in place and it will work for up to 2 days - really handy for checking temperatures regularly when your child has a fever and is feeling groggy and doesn't want to keep being pulled about. Other handy additions are the round-ended scissors, which are blunt enough to be allowed on planes in hand luggage, and the Burnshield Burn Blott Satchets. When you read the chilling statistics that over 500 under 5's attend A&E every week with burns and scalds and that a hot drink can scald a child up to 15 minutes after being poured, you can see why it is a good idea to have some at hand. This product goes along with my theory that all the really good and useful baby and child products are designed by parents ! The website tells us that "Baby Aid was conceived by mumtrepreneur, Lorna Smith. Being a mum herself, and knowing first hand the reality of the accidents that can occur, from babies being burnt in coffee shops to toddler tumbles, Lorna was inspired to create something compact and stylish that every mum can carry with her at all times. With Baby Aid, mums have everything they will need for common emergencies. New mums meet up in parks and coffee shops with their new babies and toddlers to catch up (and have some caffeine) and even the most vigilant mum can’t prevent all accidents. "One of the most serious accidents is scalding with hot liquids, and I wanted mums to be aware and prepared if they were ever in this situation. This is why the Burnshield is in all of our kits." We specialise in First Aid Kits for babies and children and are passionate about child safety and preparedness." Mission accomplished ! It's a must-have for any home (or car) with small children and the really handy, not to mention penny-saving, thing is that you can replace individual items in the online store. I'm really not at all surprised that Baby Aid won Highly Commended in the Best Debut category at the BPA Baby and Child Fair a few weeks ago, it's thoroughly deserved.